picked up was this one. If I like the book its similar to then I'm in heaven!! and I find myself getting the same types of books so that proves that I really don't mind. Anyways enough about the rant more about the book! This storyline is a true page turner . I loved every moment . I have to say that just by reading the first chapter I knew I wouldn't be able to put it down. This was true I could not go to bed unless I finished it, Now I don't want to spoil the book for any of you who haven't read it but I was truly disappointed on how this book ended .I loved every page I read where Sage and Clea were together. I mean who wouldn't love a story about true soul mates right??? Now this book has been compared to Evermore and that has been sitting in my to read pile for the longest time so maybe ill pick that up next. 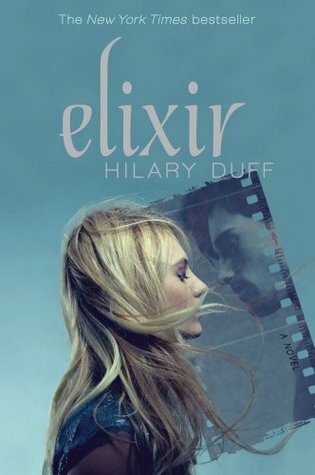 This book is truly captivating to one's heart which is why I am currently reading Devoted By Hillary Duff the second book to Elixir and so far it hasn't drawn me in yet like elixir but I'm still in the beginning we will see how it goes. I give Elixer 3.5/5 bookmarks!